Model NGWMINIB Grundig Edition. 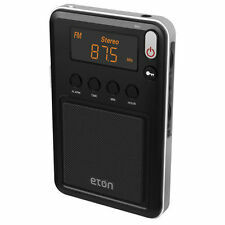 NEW ETON Digital Mini Shortwave, AM/FM, SW1/2 Pocket Radio. Tune in to your favorite local stations or listen to news and music from across the globe. With AM/FM and Shortwave bands you can hear just about everything your ears desire. 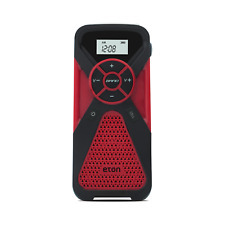 This small Desktop/Portable Radio is loaded with features. For the FM and Shortwave and the Aircraft bands there is an external attached antenna as well as a plug into which you can attach another wire antenna especially in more remote settings. This radio works great, and has quite a few features. I could not find this item in red anywhere! make it yours! case included. 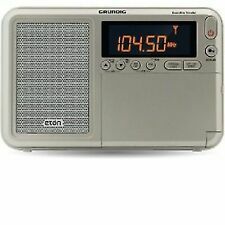 New in Open Box Grundig Eton G4000A Portable AM/FM Shortwave Radio. RED Grundig Mini M400 AM/FM Shortwave Radio with Digital Display . Condition is Used. FREE SHIPPING Shipped with USPS First Class Package. Grundig AM FM Shortwave Portable Radio Model S350DL High Sensitivity World Receiver with Alarm Clock. FM with RBDS (radio data system). AM/FM/SW Bands. Dial-in-Dial coarse/fine digital tuning. External AM/FM/SW antenna connections. Box is a couple scratches, but product will still be in perfect shape. Trending at $20.60eBay determines this price through a machine learned model of the product's sale prices within the last 90 days. Eton Grundig AM/FM/SW Shortwave Field RADIO. Shortwave Bands. Eton AM/FM Shortwave Field RADIO. With Alarm Clock, Audio In/Out & RDS. The Etón Field radio features RDS for FM. FYI, it's got RDS. Digital Tuner. Trending at $85.11eBay determines this price through a machine learned model of the product's sale prices within the last 90 days. (1)The American Red Cross Frx3 Emergency Weather Radio With Smartphone Charger,. Condition is New. Shipped with USPS Priority Mail. Trending at $40.91eBay determines this price through a machine learned model of the product's sale prices within the last 90 days. Grundig AM FM Shortwave Portable Radio S350DL High Sensitivity World Receiver. Condition is Used. Telescopic antenna is broken, a segment has become detached (see photo) Overall functions as normal. Downsizing my small collection of shortwave radios. Got it as a gift but don't need it. Item is as pictured. American Red Cross emergency radio. Features include: Flashlight Cell phone charger Hand crank power generator Single red flashing light Emergency siren New in box. Digital tuner and display. Bluetooth® ready. AM/FM/NOAA weather bands. S.A.M.E. and NOAA weather alerts. Rugged1 and IPX4 splashproof. Tune in to your favorite local stations or listen to news and music from across the globe. With AM/FM and Shortwave bands you can hear just about everything your ears desire. So small, so global, so useful when you’re traveling to foreign lands. Features: alarm clock, AM/FM radio, digital tuner, receives shortwave band, headphone jack. In 2007, EtÃ³n began instead including a coupon for a free adapter for whatever phone you have. So, the first thing you want to do when you get the radio is fill out the card with your cell phone's make and model and send it in to make sure you have your adapter. 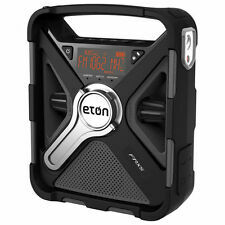 Let us lay the cards on the table and list the features found on this radio all of which contribute to its value This sale is for an Eton E1XM radio that is has had all of the sticky finish removed. 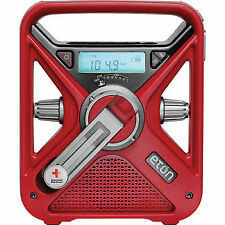 Pre-owned eton FR-200 FM/AM/Shortwave World Band Radio in green. Radio has been tested and works as it should with no issues. Very good condition. I'm not sure radio was ever used. Case & instruction book included as shown. 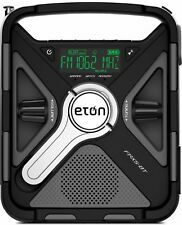 The Eton Mini Super Compact Radio gives you access to news and music from across the globe, right in your pocket, whether on an AM, FM or Shortwave frequency. Tune in to your favorite local stations or listen to news and music from across the globe. L.L. Bean Elton radio FR radio that operates by battery, hand crank, or 4.5 v DC adapter (not included). Everything works as intended. Hand crank works to power the radio and light when batteries are depleted.